A nostalgic look at bungalow-era gardens and contemporary interpretations of Arts-and-Crafts ideals. Steuben’s Glass Works’ distinctive designer shone during a century of art glass innovation. Scenic Timberline Lodge on Oregon’s Mt. Hood preserves the work of WPA artisans for today’s visitors. The founders of Stover’s Candy adopted the bungalow theme and found sweet success. A historic Florida neighborhood’s shotgun bungalows sprang from a cigar-making heritage. A second life for a modest Southwestern bungalow begins our new series on homeowner renovations, additions and new construction. “Green architecture” uses recycled elements and modern materials to create a distinctive architect-built home in Washington state. Marie Glasse Tapp’s Tile Restoration Center follows the master’s lead. 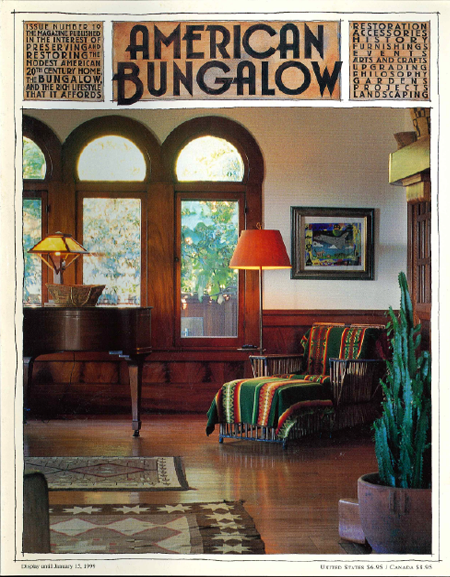 Join American Bungalow at Pasadena’s popular fall Arts and Crafts show. Guest essayists share their views on living the bungalow lifestyle.